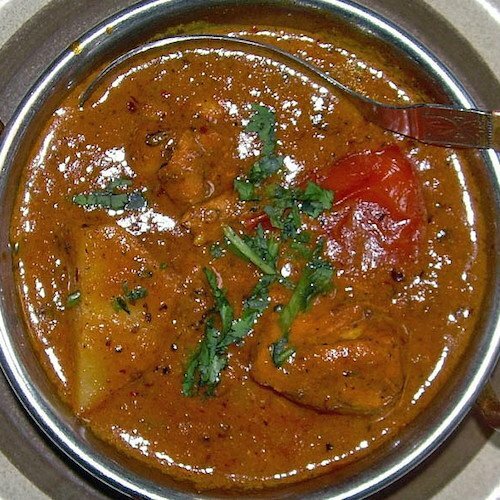 From the Kitchen: Chicken Vindaloo | Stahancyk, Kent & Hook P.C. Chicken vindaloo curry, just waiting to be served. In the mood for something easy and delicious? We’ve got just the thing for you with this great East Indian dish! Combine onions and garlic in large pan on medium heat. Sauté onions until translucent, then add tomatoes, curry paste and chicken. Coat chicken with paste and cook for five minutes. Add balsamic vinegar, honey and chicken stock; bring to boil & turn down heat to just simmering. Cook for 50 minutes to one hour. Add cilantro and season to taste. Enjoy with balsamic rice or Indian bread!